We love welcoming new people along to our meetings, so if you’re interested in improving your public speaking and leadership abilities, please feel free to come along as a guest and see what the club is all about. There’s no obligation to join or speak – you’ll receive a warm welcome and be introduced to a member who can explain the evening and answer any questions you have. Toastmasters International is the leading movement devoted to making effective oral communication a worldwide reality. Through its member clubs, TMI helps men & women learn the arts of speaking, listening & thinking – vital skills that provide self-actualization, enhance leadership, foster human understanding, & contribute to the betterment of humanity. It is basic to this mission that TMI continually expand its network of clubs, thereby offering ever-greater numbers of people the opportunity to benefit from its programs. 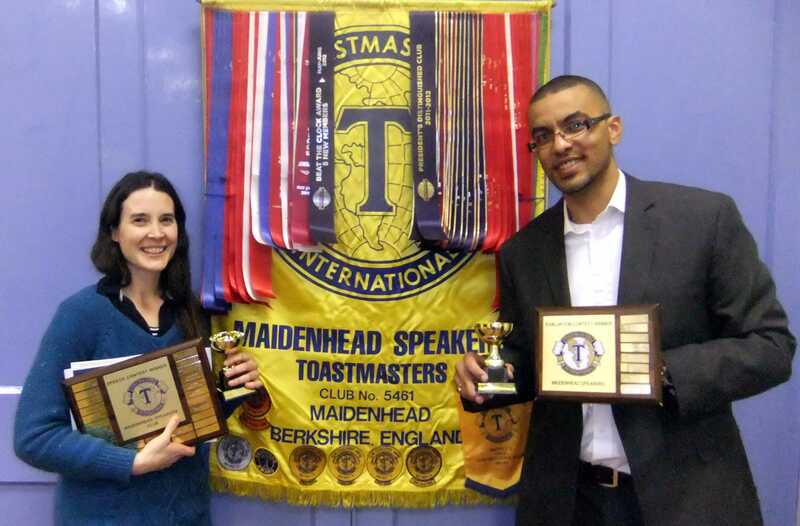 New members are always welcome regardless of experience or speaking abilities – Toastmasters is open to anyone aged 18 years or over. 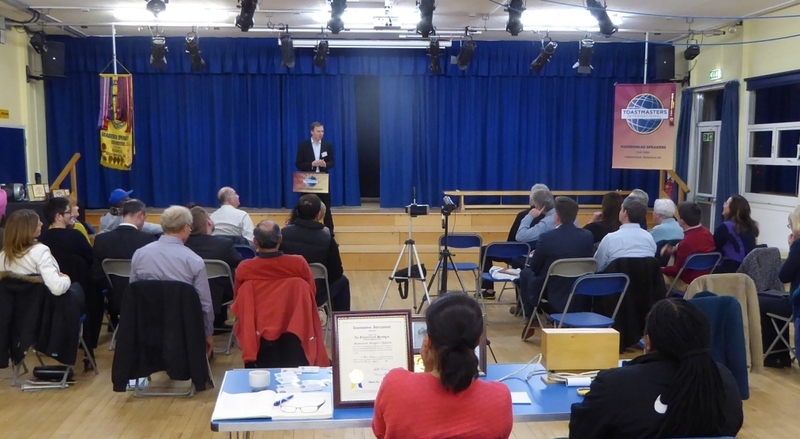 We follow the tried and tested Toastmasters International training programme which provides education and guidance for all levels of speaker whether delivering that first business presentation, family speech or how to handle television interviews. Initially, new speakers follow a structured programme of 10 training projects, each focusing on key speaking skills including speech organisation, gestures and vocal variety. New members have the option to have a mentor who will provide guidance on their initial speech projects. Our meetings provide an opportunity to deliver both prepared and impromptu speeches and to gain essential feedback, all in a friendly and supportive environment. Some meetings include educational sessions on aspects of public speaking. We are a non-profit organization. Currently subscriptions are £57 per 6-month period, with a one-off joining fee of £18 which covers the cost of your training manuals and guides. As a member of Toastmasters International you will receive a monthly magazine full of articles on public speaking and personal development. You’ll also be welcome at any of the other clubs in the UK and around the world. 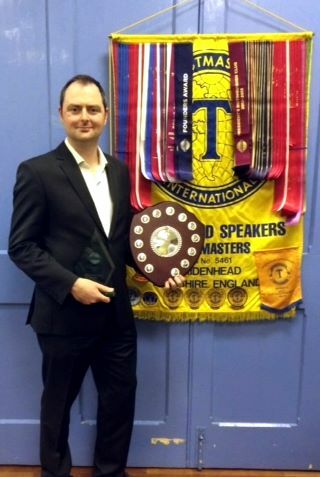 Chris Boden (below) proudly showing off the trophy he won in May 2014 at the District Conference in Dun Laoghaire – the highest prize achieved of any speaker in a competition in the whole of Maidenhead Speakers’ Club’s history! Double-winner of 2015’s International Speech & Evaluation Contest Chris Boden, receiving his awards from Club President Julie Farrell. 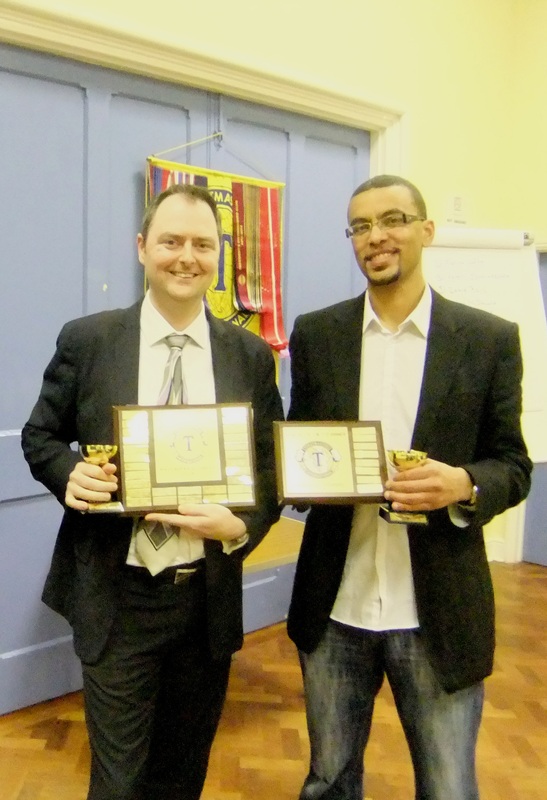 Chris Boden (Speech Contest) & Yohan McDonald (Evaluation Contest). Julie Farrell (Speech Contest) & Yohan McDonald (Evaluation Contest). To prepare all of my speech and leadership projects to the best of my ability, basing them on projects in the Competent Communication, Advanced Communication or Competent Leadership Manuals.